Please refer to our stock # 1267 when inquiring. 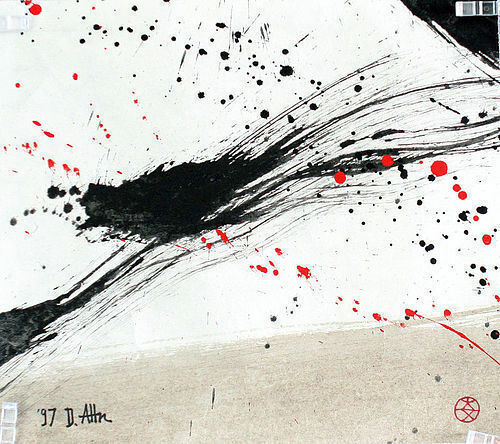 Dragon painted in 1998 by Renowned Korean Artist Don Ahn aka Ahn Dong Kuk (1937-2013). We encourage you to research Don Ahn's sales record and market prices on sites such as Artsy, so you can appreciate what a great opportunity this is to purchase an original work of art by the master at a price well below the actual value. Don Ahn was a pioneer of Korean art in America. In the 1950s he was the first to move permanently to the US and receive recognition here, beginning with the 1952 exhibition of his work at the Kilbride Bradley Gallery in Minneapolis, the very first exhibition of Korean contemporary art in America. His work is in the permanent collection of the Museum of Modern Art in New York, and other major museums. There was recently an exhibition of Don Ahn's work at the Walter Wickiser Gallery in New York's Chelsea art district. Ink and color on paper. Unframed Dimensions 13.25 x 11.75 inches, 33.5 x 30 cm. See also preeminent art critic Holland Cotter's review of Don Ahn's work in the April 4, 1997 New York Times article, Of Asians Among the Abstractionists, where he describes Don's paintings as "Exuberant" and "Inspired by Zen brushwork".